THOUGHT stumbling upon your ex on Tinder was bad? 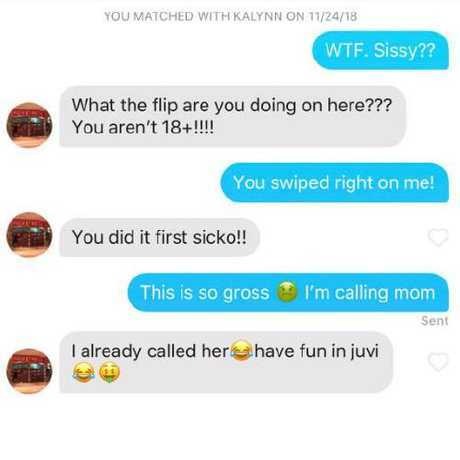 This American teen was horrified when he matched with his own sister on the dating app - and their awkward messages will make your toes curl. Weston was immediately weirded out when he stumbled upon his older sister Kalynn yesterday, but still decided to swipe right and chat. When she did the same a while later, the pair matched. 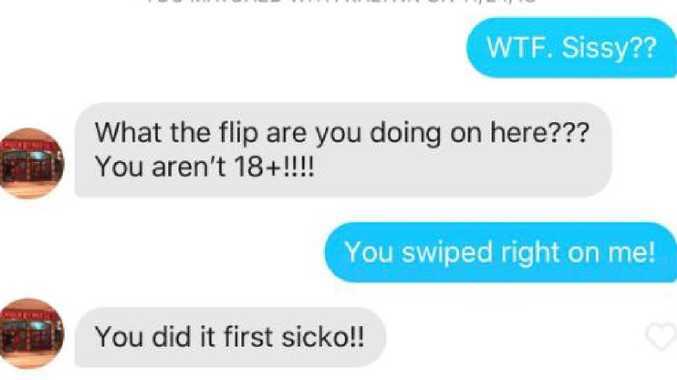 He tweeted a screenshot of their chat, joking: "WTF Just matched with my sister on tinder. Someone execute me I want electric chair", and it soon went viral. In the conversation, he asked: "WTF. Sissy?" and she immediately quipped: "What the flip are you doing on here??? You aren't 18+!!!!" Weston replied: "You swiped right on me!" and she said: "You did it first sicko!!" while he said: "This is so gross. I'm calling mum". And his sister joked: "I already called her - have fun in juvi", with reference to Tinder's 18+ age limit. Until two years ago, the app allowed users as young as 13, Facebook's minimum age requirement, to join up.